Vintage Signed Sarah Coventry Green Stone Pearl Flower Gold Tone Brooch Pin 2"
Vintage Signed Sarah Coventry Rhinestone Gold Tone Costume Dangle Brooch Pin! 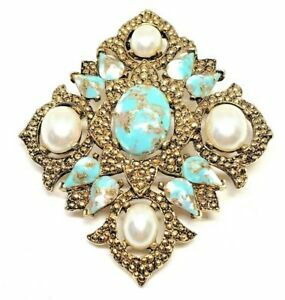 VIntage fine Sarah Coventry jewelry pearl turquoise brooch pin gold metal mint! Vintage Sarah Coventry Pin / Brooch Pearls Opalescent Designer Signed 1 7/8"
SARAH COVENTRY Gold Tone " MIRACLE STONE " Brooch Pin Early Piece 1 5/8"